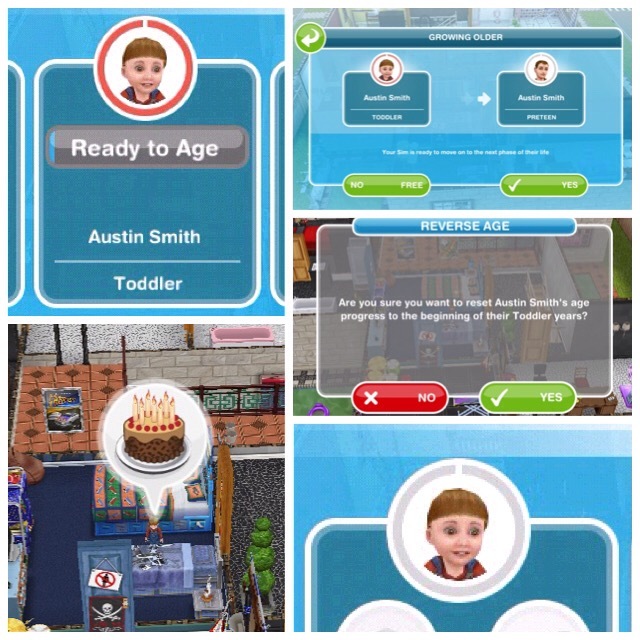 The Sims Freeplay- Ageing UPDATE! A few people have asked me about this so I thought I would make a post just to explain the latest change with the ageing. As you probably know by now, once you complete the Life Dreams and Legacies Quest your sims will begin to age automatically. Previously once the circle that appears around their face was full and red you needed to either age them to the next life stage or use LPs to reverse them back to the beginning of the life stage they are currently at. For example, if your adult sim was ready to age you would have had to make them a senior for free or use LPs to reverse them back to the beginning of their adult stage. Now, instead of costing LPs you can reverse your sims back to the beginning of their life stage for FREE! How does it work? To reverse their age all you need to do is wait until their time is up and the birthday cake appears above their head. Click on the birthday cake and the growing older pop up will appear, just click NO if you do not want them to age. It will then ask you if you are sure you want to reset them to the beginning of that life stage, click yes if you do. Once you click yes the circle around their face on the simtracker will be empty ready for them to start ageing again! This change is a great move as I know a lot of people were using far too many LPs to keep their sims at the age they currently are- mostly so they can complete events! Although it does sort of make earning platinum orbs to pause your sims at their current life stage a bit pointless! How many times can you reverse them? It seems like you can do this as many times as you want! NOTE: I don’t know if this is a permanent change but lets hope so! i love your blog posts and youtube site! thanks! Thanks for posting this. I’ve resisted progressing my game through Life Dreams because I didn’t want to deal with the aging process, but that’s meant there are parts of the game I can’t do. Now I’m willing to give it a try, but I think I’ll keep a non-aging version of the game on a secondary device, just in case I don’t like it. You’re welcome! Lets just hope they don’t remove this nice new feature once everyone completes the quest! I’ll second that!!! I also refused to do this quest due to the aging issue but may try it now. Please, tell me, is this feature still on? I’ve returned to the game after a long time off it and I was really hoping the aging process can be reversed now. I haven’t proceed through the Life Dreams and Legacies quest yet but I’d love to if there is a way to keep all my sims for free. Yes this feature is still available! If you don’t want your sims to age and die then I would suggest you stay on the in stitches quest, you can always change your mind later and finish the quest and then start on the life dreams one! 🙂 I’m glad it helps! It is exactly as the steps in the post show you, no birthday cakes are needed. You just click no and they will reverse back to the beginning of that life stage for free and you can reverse them as many times as you want. Hey, I was just wondering if this is still happening, like is it still free to reset now, or if it was only this event, or only events in general. I have not started the life dreams and legacies quest because I don’t want my sims to die, but if I can do it this way, I might as well finish it. As of the latest update it is still free. It looks like EA posted an update on their official website about the aging process that did not mention it was free now. It was posted on April 12, 2017. I wonder if this means they are going back to the old way? I surely hope not! Have you got the link to that post? It is still free for now anyway! Notice the post date and the explanation. Maybe they just aren’t voicing it? That post may have been posted recently but some of the information it contains seems to be out of date, for example, sims don’t grieve anymore when someone close to them passes- they haven’t for a very long time! I’m so scared this is just going to reel me into finishing the quest and then end up costing me later I wish they would update us as to whether it is permanent or not…..thank you so much for keeping us as up to date as possible! I think you’re wonderful! I’m wondering that too! It would be nice to know for sure. Is this still the case? I hope it is! Yes this is still in the latest version. don’t know if I should start this quest or not, I don’t want my sims to die, and I only have 8 LP’s. Please help. Yes this feature is still available on the game. are the first place that I come to! Thanks! I’m glad it helps! I’m glad that the age reversal is free! I have much work to do and hobbies take along time! I really want to finish the potion making hobby, to unlock the furniture set. I don’t really care for the fashion, skating or ‘boring’ hobbies. I wish there are more hobbies for the kid sims since kids can do a lot of things besides skating and diving, just like in real life! Kids can do gymnastics and art, ect. Why limit them! I love the animals in the game and I made the choice to go for the Animal Place on mysterious island. Can kittens and puppies be used there? Puppies and kittens cannot complete the hobbies at the pet park unfortunately, these are just for dogs and cats. I just recently finished the life dreams quest and all of my sims are aging…except for those who have profession careers. I send them to work everyday but they don’t seem to age at all. Is there a reason why they’re different? Thank you for this great blog! Strange, they should be ageing too, I don’t know why they aren’t, sorry! Is this feature still on? Just wondering because I am close to getting to this quest and don’t know if I want to finish the in stitches quest? Thanks for writing this it’s super helpful! Yes you can still reverse sims for free and you’re welcome! Do you know if this still applies with the newest update, the one with the love and treasure quest? Thanks! Yes this is still in the latest update. Hi! I don’t want any of my sims to age, so I basically stopped performing the task. But I already opened the age controller. Will my sim still age if I won’t continue it? This is such a relief for me. I always want to 100% my games, but I wasn’t ready to give up my sims (which is why I have barely played The Sims Mobile), so I was mentally preparing myself to having to go with an ‘incomplete’ game, stopped at the In Stitches quest, while cringing everytime I looked at the Misterious Island. But if this is to be permanent, now I can actually do the stuff?? Infinite cheers, and a blessing to you for the heads up! Let’s hope so, it has been around for a while now so it looks like it might be a permanent feature 🙂 you’re welcome! I decided to keep giving my sims life goals as the platinum orbs are each worth 300,000 simoleans which comes in really handy when new stores are added and cost a lot to build. Love your blog – been so helpful, especially the tip about earning lps through the cooking hobby. Is reversing age still free? Wow, I’ve been checking your blog and it really helps a newbie like me. You cover all areas. Thanks so much! Hi! So…I accidentally aged my nephew and didn’t mean to. Is there a way to go from preteen back to toddler?? Unfortunately no, once you age a sim they cannot return to a previous life stage. D: Okay, thank you. He’s only 5 so he’s closer to that age than preteen but oh well. I wish there was an age in between. My daughter is 7.5 so she’s in between those ages too. My Sims are so random. I have family, a couple of friends, and then Markiplier, Bunny Meyers and her boyfriend Dogman, The Osbournes (Ozzy and fam), the family from the musical Next To Normal, the 10th Doctor (except he aged so now he’s more like Capaldi). Is sim age reversal still free? With the aging process being able to be stopped for free, do you recommend just selling platinum life orbs? Or hoarding them for when you need extra simoleans? Platinum orbs take such a long time to make I wouldn’t recommend selling them, I would rather pause the sims I wanted to keep forever so I don’t have to keep reversing their age but it is completely up to you!